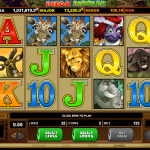 Mega Moolah is probably one of the best progressive online video slot games out there from Microgaming. Mainly its popularity revolves around its life changing jackpot, but at the same time this is a progressive penny slot which means you do not have to break your bank to play it. Even though most of us are here for the gigantic winnings we should not left the theme of the game unnoticed either. 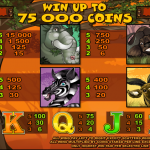 Mega Moolah is entertaining animal themed game, and all the special symbols are jungle related. The lion is the wild in this game, as we would expect the king of all animals to have a major role in this game. It substitutes for all the other symbols to complete a winning line, except for the scatter. Every win the wild is part of is also doubled. It seems like a minor role, but in the long run very profitable. The red headed creature is the scatter and it is the key to the free spins feature. For landing 3, 4 or 5 free spins you receive 15 free spins with all wins tripled. So you are probably wondering how Mega Moolah’s progressive jackpot can be activated. As in many similar games it is triggered randomly. One hint only, the higher the stakes the higher the chances to activate it. 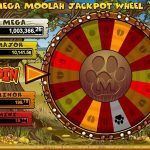 Mega Moolah is one of those Microgaming’s games that you have to try, to feed your curiosity at least. There are 4 jackpots available with amounts that gradually increase until you get to the Mega jackpot, and we believe that any of them is worth winning. Mega Moolah is very entertaining and highly addictive game with lots to offer. There are special features that will keep you coming back for more. For a chance of a huge win you should consider playing Major Millions a 5 reel slot by MicroGaming.